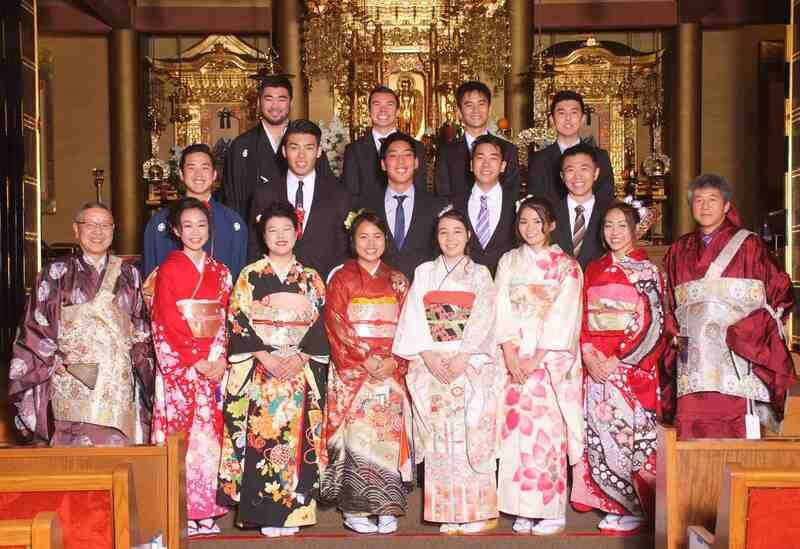 GARDENA — The Gardena Buddhist Church recently held its annual Seijin Shiki, a coming-of-age ceremony typically held in Japan in the month of January. This year’s participants were Ryan Nation, Cheri Morimoto, Sean Kato, Christine Nakamoto, Kregg Maruyama, Alyssa Arnheim, Lauren Yoshiyama, Jennifer Takeda, Melody Ames, Masanao Yonami, Ryo Ueno, Shogo Nakamura, David Lin, Shogo Kono, and Yujin Okuda. Certificates and commemorative gifts from the church were presented during the ceremony, which was officiated by the head minister, Rev. John Iwohara, with assistance provided by Rev. Nobuo Miyaji, the associate minister. Congratulatory messages were delivered by Rev. Iwohara and Church Board President Nadine Kakimoto. After the ceremony, the recipients were presented with a brief history of the tea ceremony and learned the proper performance of the ceremony in the temple’s Japanese tea room. Participants from the Keiwakai Group of the Omotesenke School of Tea Ceremony were Kay Sokei Inose, Chiguro Shibasaki, Tomoko Kawai, Kiyoko Yoshiyama, Helen Sakamoto, Risa Tanaka and Momo.